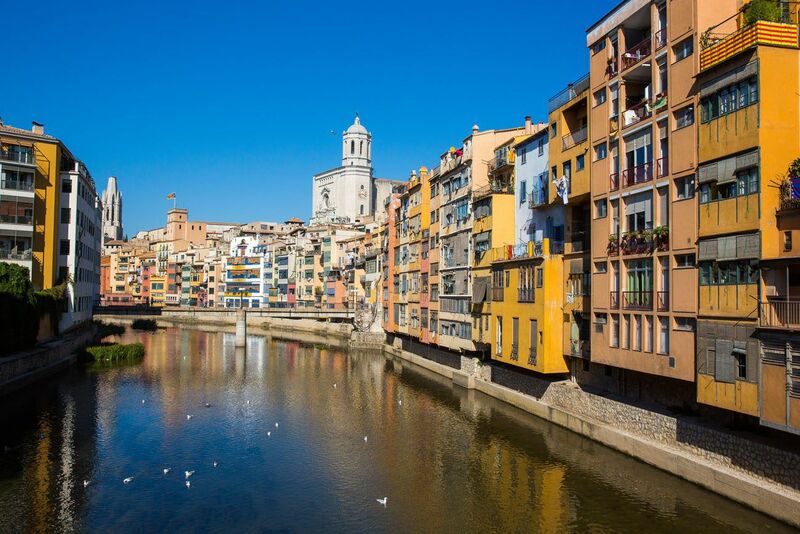 Girona, located in Catalonia, Spain, sits between Barcelona and Costa Brava. It’s a gorgeous place to visit, with medieval walls, narrow winding city streets, and one of the best preserved Jewish Quarters in Europe. 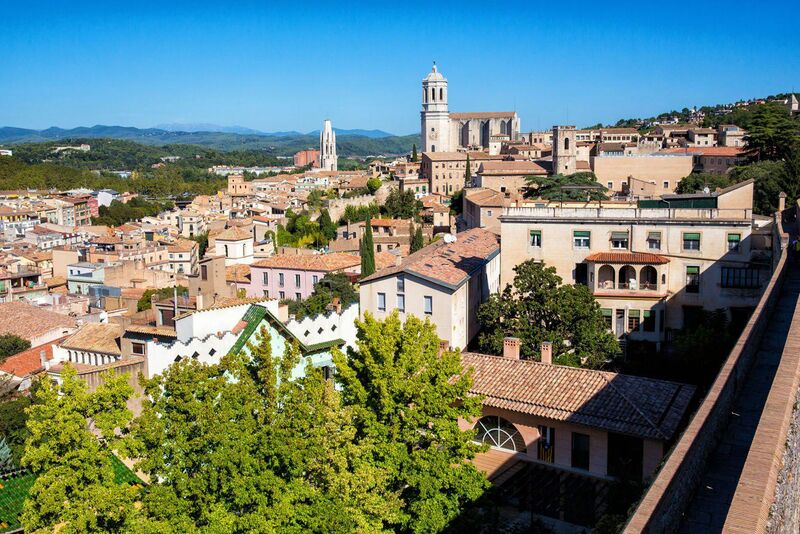 All you need is one day to see the best of Girona, making it a great destination on even the quickest itineraries through Spain. 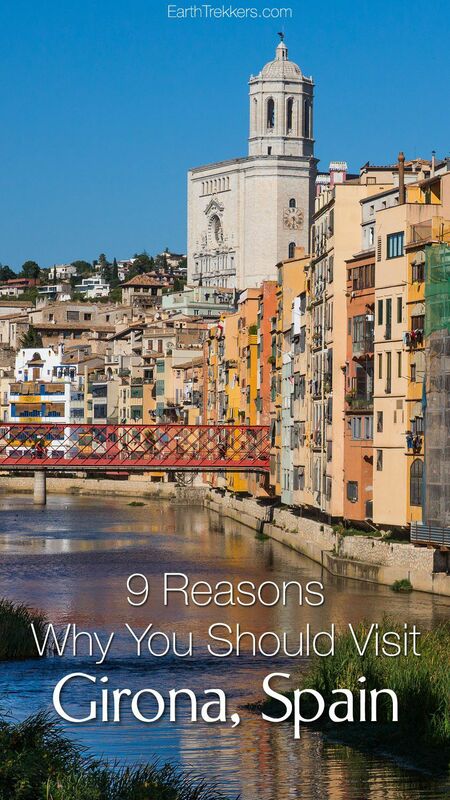 Here are 9 great things to do in Girona…9 reasons why you should visit Girona, Spain. 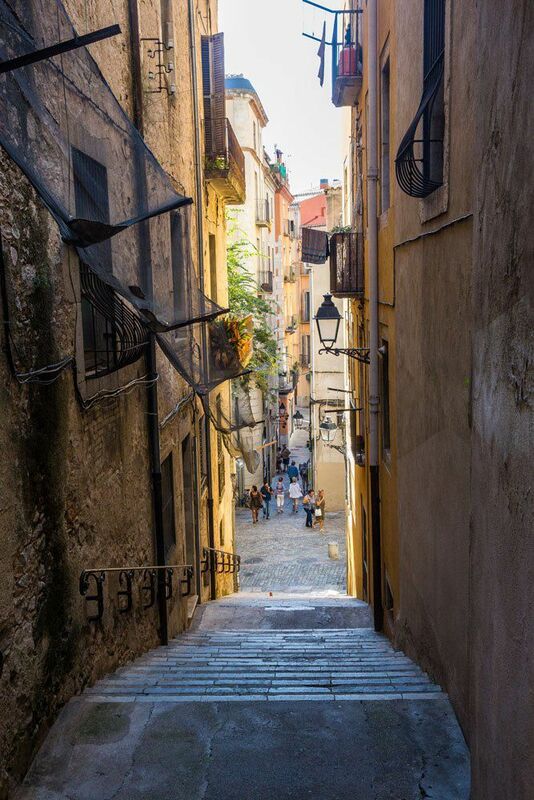 The Jewish Quarter in Girona is one of the best preserved in the world. From 982 to 1492, Jews lived in Girona. The area where they lived, called El Call, is a maze of narrow, winding, cobblestoned lanes, still intact and very much like they were over 500 years ago. These narrow streets are a joy to explore. For those who want to learn more, visit the Jewish Museum in town. 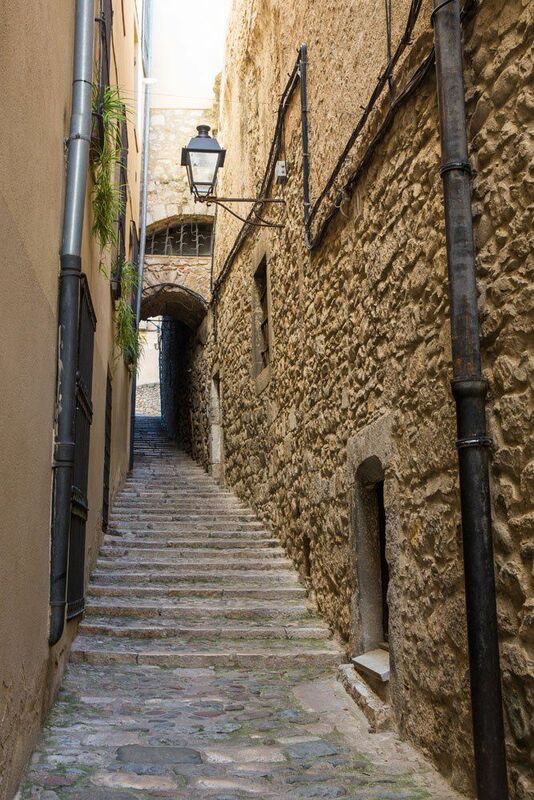 Getting Here: The Jewish Quarter is located in the heart of Girona, off of Carrer de la Força. 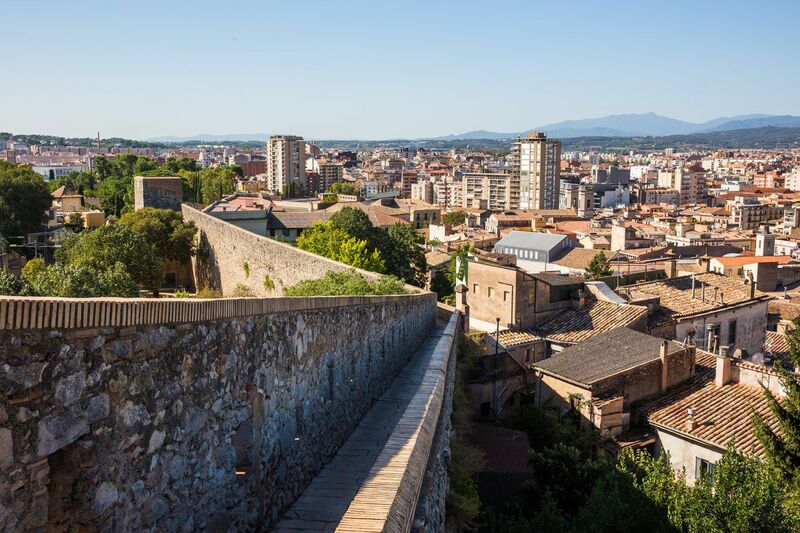 Also called the Passeig de la Muralla, a walk on the medieval walls is a must-do activity while in Girona. 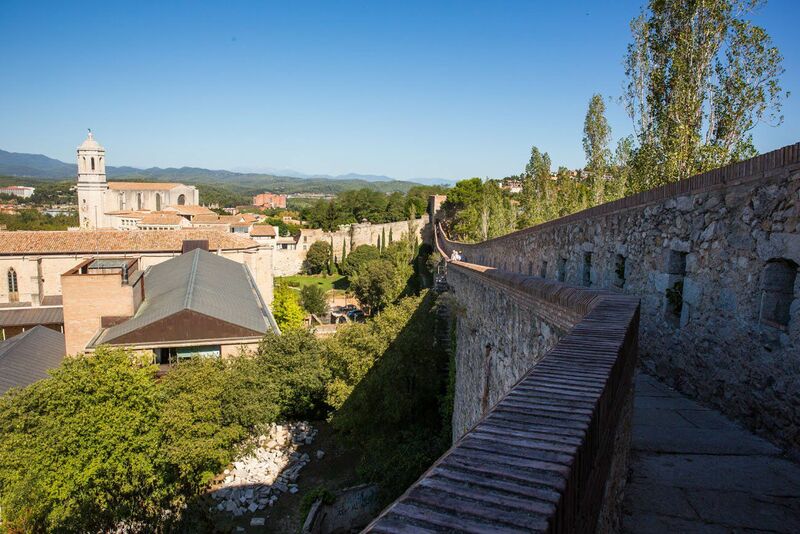 The city walls span the eastern border of the old town of Girona. From the top of the walls, the views over the city are spectacular. Towers periodically interrupt the walls for even better views. Gustav Eiffel constructed a bridge in Girona just before the Eiffel Tower was built. 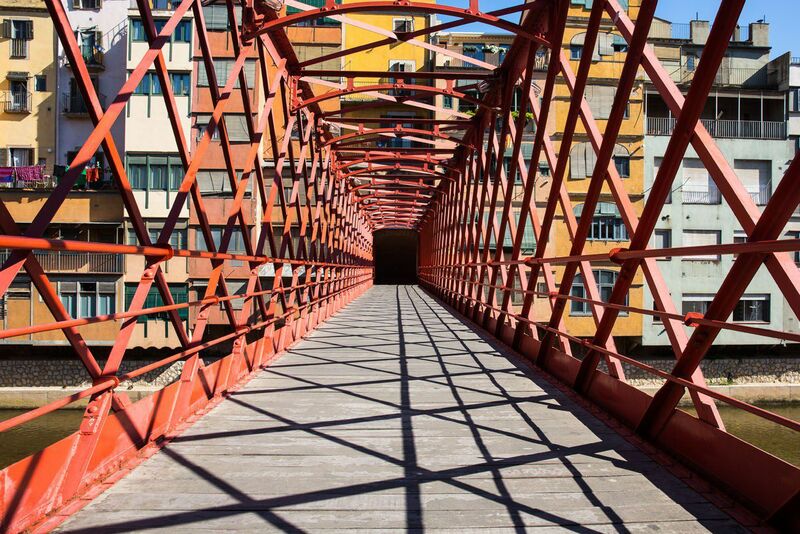 Also called the Pont de les Peixateries Velles, this bridge spans the Onyar River and is the most famous in Girona. 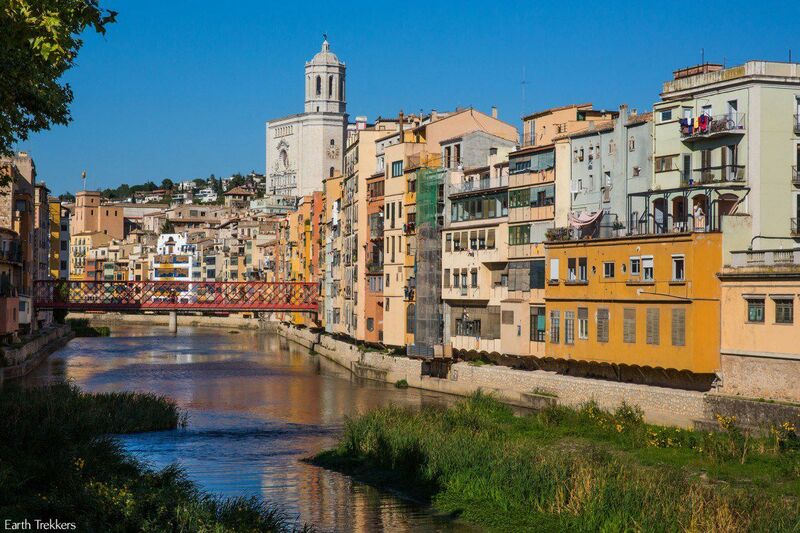 The Onyar River runs through the heart of Girona. See it from Pont Pedra, Eiffel Bridge, or one of several other bridges that span the river. 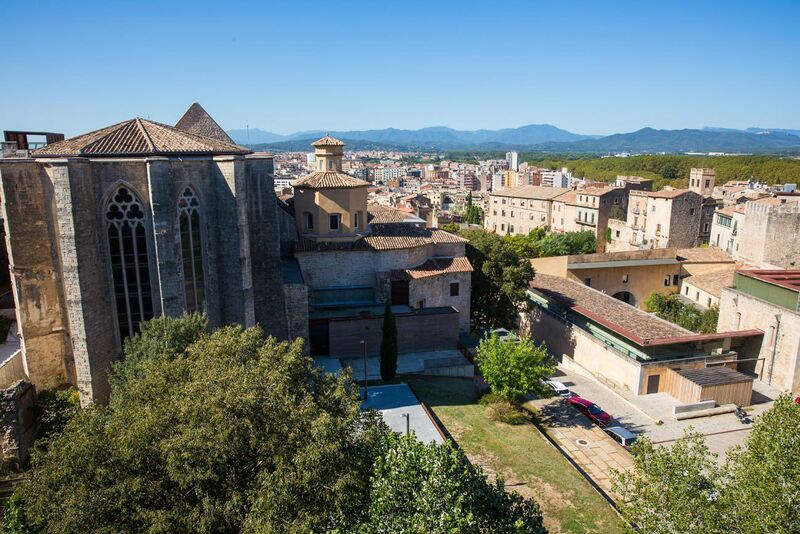 One of the highlights of a visit to Girona is a visit to the Girona Cathedral. The Girona Cathedral dominates the skyline of Girona. Perched on top of a hill, the only way into the cathedral is to climb the long staircase to the entrance. It’s a scenic spot and a popular gathering point for visitors to the city. OK, so this came as a total surprise to Tim and I. Prior to our visit, I had read that the Girona Cathedral was used in Season 6 of Game of Thrones. 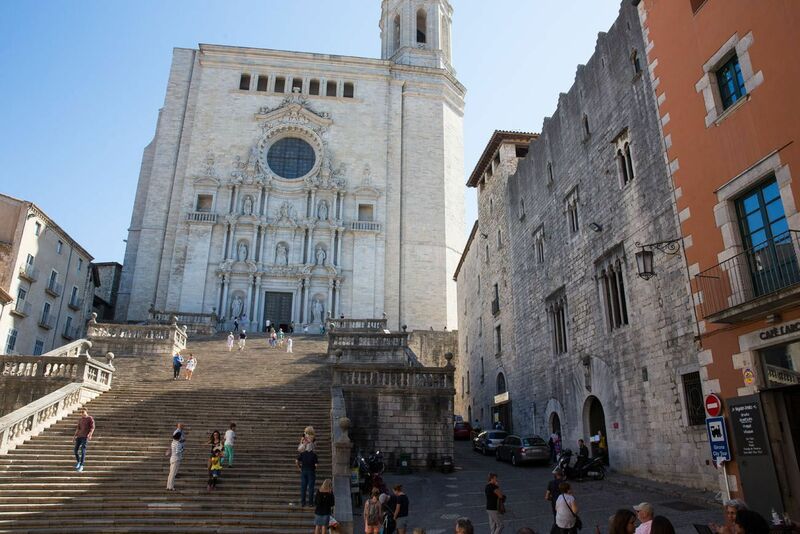 As we were sitting in front of the cathedral, I did a little more research, learning that Girona was a major filming location for Game of Thrones. Girona is Braavos in Season 6. With the narrow, twisting lanes in the Jewish Quarter and the Girona Cathedral, this city makes the perfect backdrop for Game of Thrones. 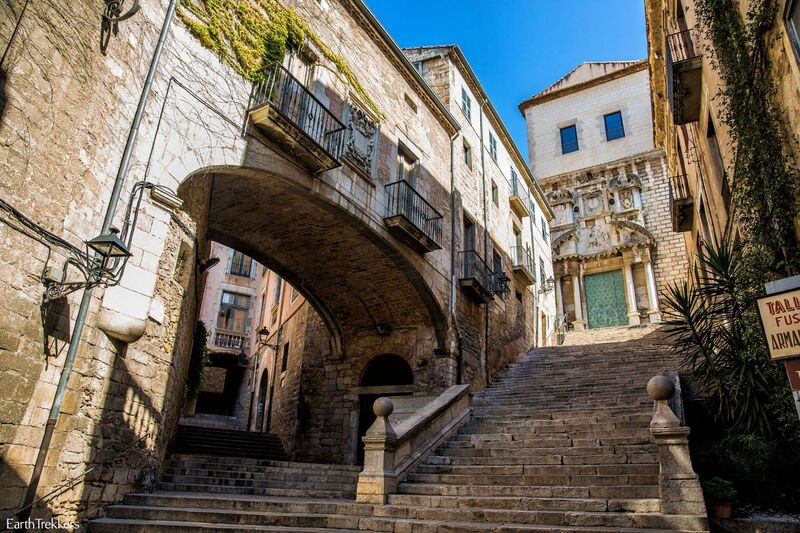 If you are a Game of Thrones fan, Girona is worth a visit. Many of the filming sites here were used with very little computer generated imagery, so these places appear almost like they do in the show. Do you recognize the photo below? When Arya is running away from the waif, she tumbles down this staircase. 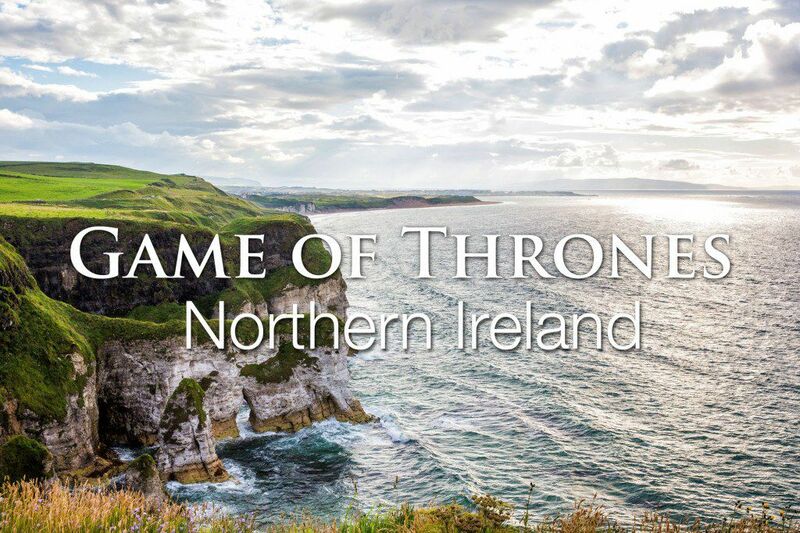 You may also like: Game of Thrones Filming Locations in Northern Ireland…What You Should Really Expect! 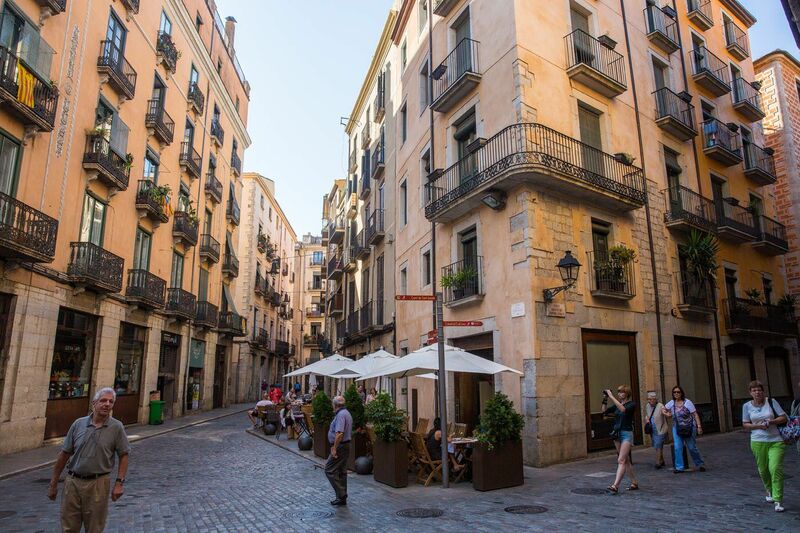 There’s more to Girona than medieval walls, narrow streets, and filming sites…the city itself outside of the main tourist quarter is a joy to stroll through. Browse small shops, have coffee in a cafe, or just wander the city. Plaça Independencia is a lovely square located just west of the Onyar River. 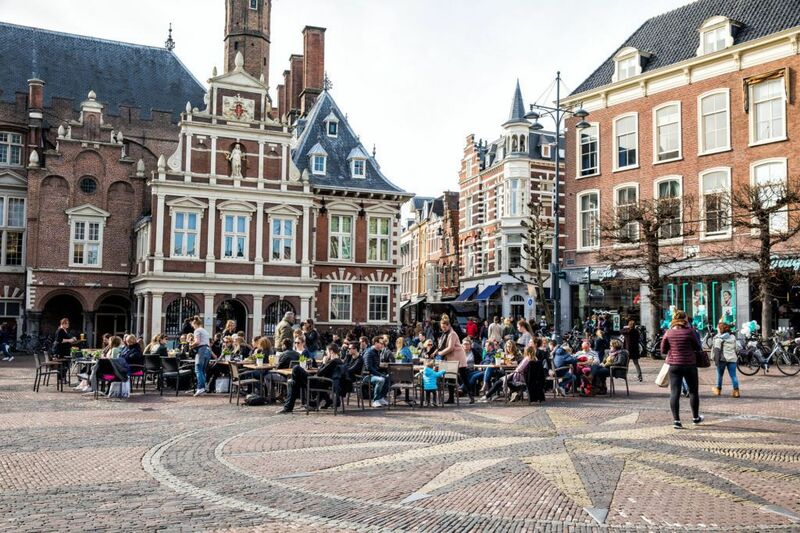 If you are in the need of a break, stop here for coffee or wine and do a little people watching. Girona is 100 km from Barcelona. It may sound far but the two cities are connected by a high speed train. 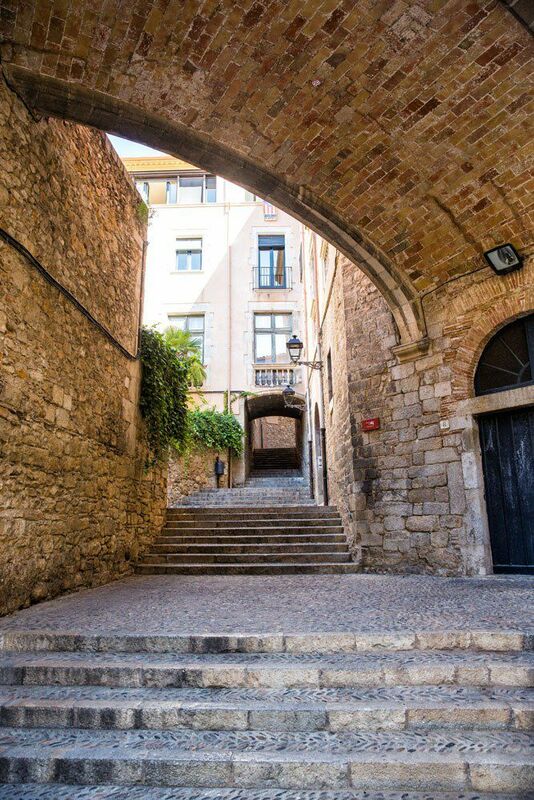 If you are staying in Barcelona, in just 38 minutes you can be standing in Girona. Take the train in the morning, spend the day in Girona, arriving back in Barcelona in time for dinner at 8 pm. Yes, Barcelonans eat dinner between 7 and 10 pm…it took us a little bit to get used to this schedule. 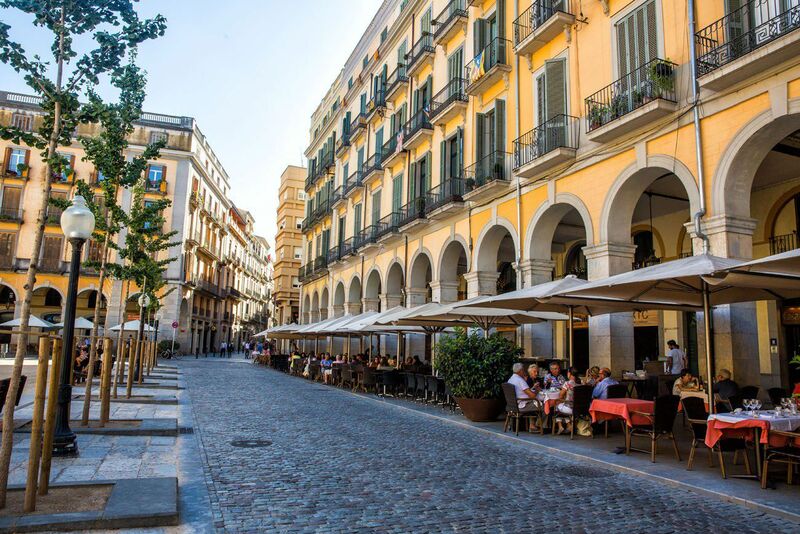 The trick is to take that midday siesta…which may be a little difficult while in Girona…but that’s what the coffee break in Plaça Independencia is for! Taking the Train: Barcelona and Girona are connected with the new high speed AVE trains and the TGV trains that continue on to Paris. In Barcelona, you can purchase your tickets at the Estacio Sants Train and Bus Station. Trains leave approximately every 45 minutes. We purchased our tickets the morning of our trip out to Girona and there were still vacant seats. We ate at Cafe le Bistrot, primarily because of it’s location. We sat at one of the small tables outside, enjoying the view. The food was mediocre. I ordered mussels as an appetizer and had to send them back because they did not seem to be cooked thoroughly. But it was a nice, quiet spot and we enjoyed our long, leisurely lunch. Hi Kellyn! Sorry for jumping into your comment ?We are also searching for moving to Spain and ñioking at Girona. 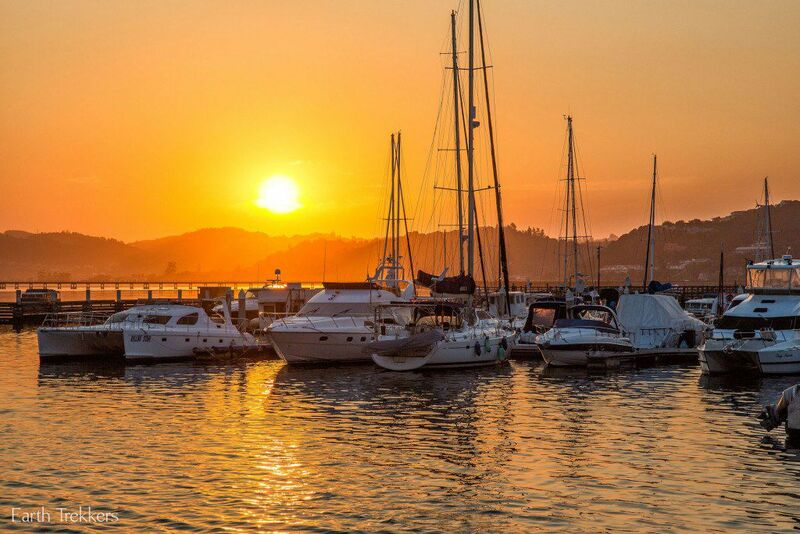 I wonder where have you found your dream – in Barcelona or in Girona? ? 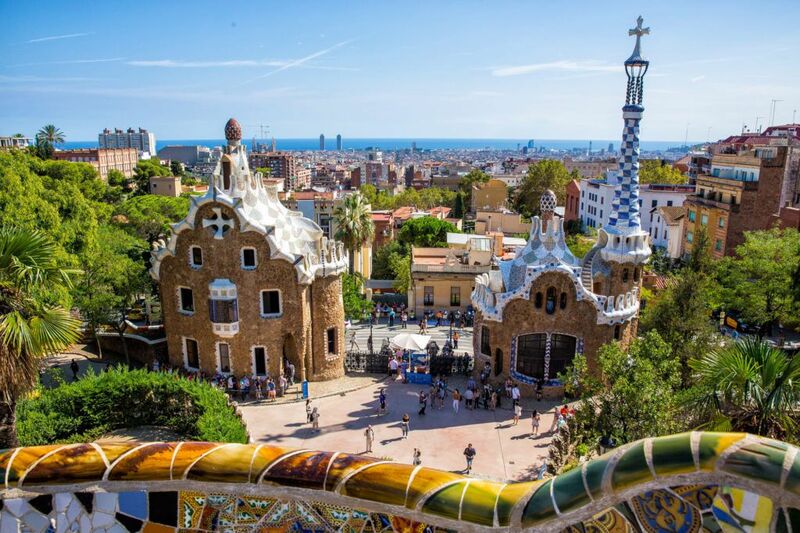 We enjoyed reading your posts and we are looking forward to our trip to Barcelona, Seville and the Canary Islands. Sounds like a nice trip. Have fun! Thanks for sharing. You gave a lot of incredible tips that could be very useful for my family. I recently discovered Girona while looking for apartments in Barcelona. We are in currently researching whether to move to Spain. I am also looking for apartments in Spain and happened on Girona. I would be very interested in hearing what you discovered in your research. Thanks and I hope by now you have found your Spanish dream apartment!! !